Low Maintenance and durable; wont swell, crack, split or warp. Reduced carbon footprint with energy savings outweighing initial energy input by over 100 times. Corrosion resistant qualities and resistant to weathering under a range of harsh environmental conditions. Economical framing solutions that can be less expensive than other framing options. Strong and durable providing a range of long lasting design options. Environmentally sustainable material with one of the highest recycling rate of any material. Range of coloured finishes available to match your home’s décor. Significant performance improvements provide a short payback period. High performance aluminium windows are able to meet or exceed energy efficiency standards. Aluminium windows and doors can easily achieve improvements in hear gain and heat loss through windows 60% rivalling more expensive timber and uPVC equivalents. In the case of an average gas heated home in Melbourne, the use of aluminium double glazed windows delivers CO2 equivalent savings of almost three times that required to produce the aluminium frames, just within the first year. Over the life of the building, energy savings outweigh the initial energy input by well over 100 times. For homes with electrical heating, or cooling for homes in hot climates, savings run into multiples of close to 300 times. The corrosion resistant qualities of aluminium provide a low maintenance frame and is resistant to weathering under a range of harsh environmental conditions. Unlike many other material, it will not swell, crack, split or warp over time, ensuring an extended product life. The inherent strength and flexibility for aluminium to be manufactured to exacting specification means you are limited only by your imagination. With an endless array of systems, finishes and glass option, aluminium offers a vast range of possibilities from the economical to most elaborate systems while also delivering excellent thermal performance. A range of finishing options ensures aluminium windows and doors can be perfectly matched to any décor. Powder coating provides an attractive finish to aluminium frames and once coated, does not require repainting. The interpon colour range gives you the freedom to create the look you want using a variety of natural colours to blend into the environment and colours to coordinate with Colour bond steel as well as a selection of unique pearl and metallic finishes. Aluminium has one of the highest recycling rates of any metal and is an environmentally sustainable material. Recycling of aluminium requires only five precent of the initial energy consumed to create it. This inherent property differentiates from other framing materials reinforcing its sustainable credentials. Payback periods on high performance aluminium windows are typically far shorter than for other alternatives which offer only marginally improved performance at a far high price. Such options can take several decades to deliver a payback. 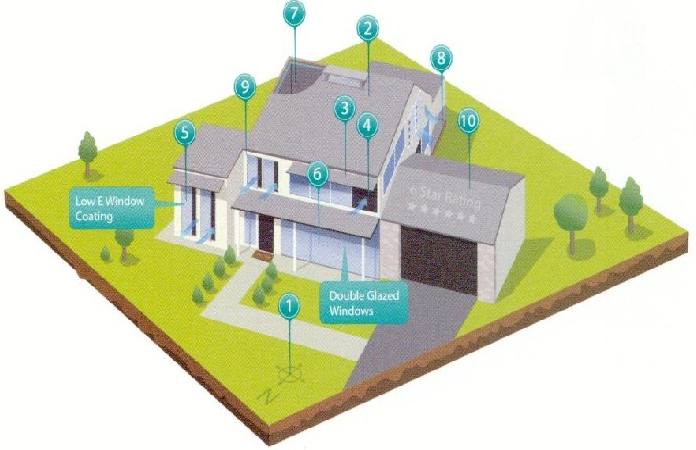 The Window Energy Rating Scheme (WERS) is managed by the Australia Window Association. It provides a system for rating and comparing the energy performance of windows and doors against one another, in a similar fashion to the rating system commonly used for white goods. 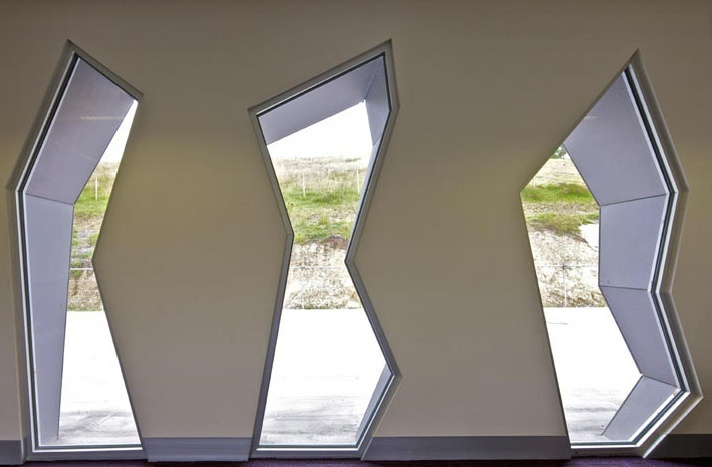 To participate in WERS, window fabricators must obtain energy ratings for their products from a rating organisation accredited by the Australian Fenestration Rating Council (AFRC) and rated windows must meet all relevant standards. In order to determine window performance data, WERS uses a window’s U Value and Solar Heat Gain Coefficient. In simple terms, the U Value is a measure of the rate of hear transfer through a window. The lower the U Value, the better level of insulation the window provides. The Solar Heat Gain Coefficient is a measure of how much solar radiation passes through the window. In cooler climates, windows and doors which transmit a greater amount of solar radiation can help to provide ‘free’ solar heating. Each individual WERS rated product has its own WERS certificate. WERS certificates include information that can help you select the best windows and doors for your home. 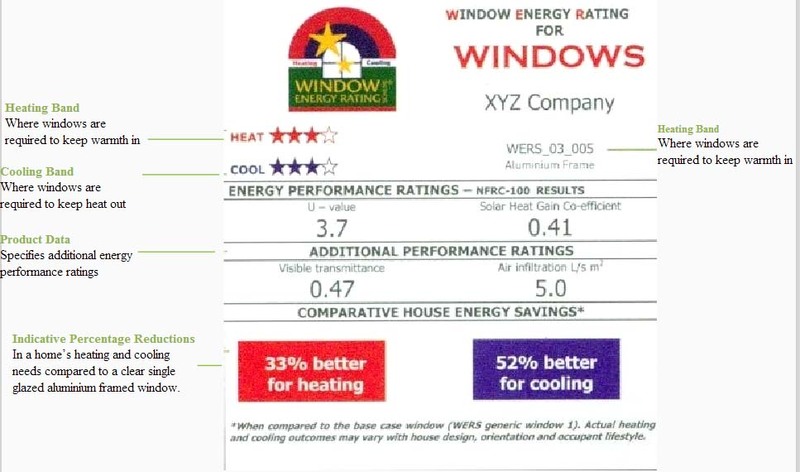 As well as the products star rating for heating and cooling, certificates feature a brief product description, performance rating data and the potential heating and cooling improvements when compared to a single glazed window. Our climate is getting warmer. Australians are now using more energy to cool than to hear their homes. The use of energy efficient windows and doors can save up to 60% of your energy costs to heat and cool in all climates. In Europe, frequent extreme cold periods and unpredictable heat waves can make for uncomfortable living conditions at times. 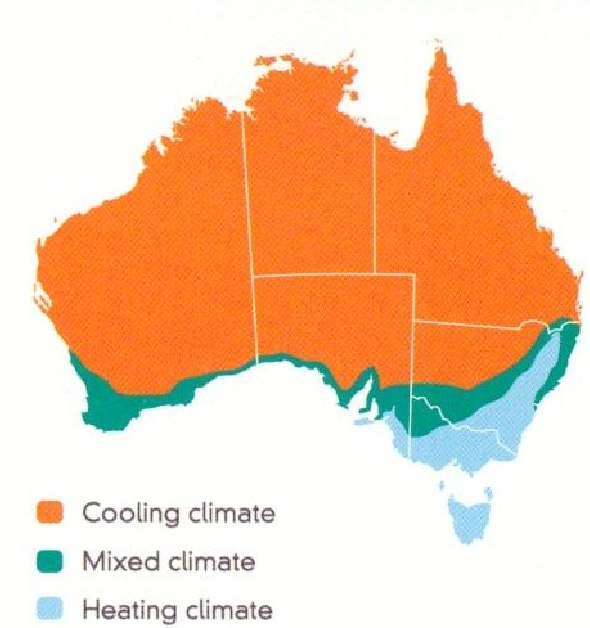 However Australia is lucky to have relatively moderate climate conditions. While some areas do experience extreme heat, these areas are largely unpopulated, and extreme cold is rare throughout the continent. The lack of extreme weather conditions means that it is relatively easy for homes to achieve very good energy outcomes. Homeowners do not need to part with excessive amounts of money for elaborate window and door systems to improve the energy efficiency of their home. High performance aluminium windows and doors can easily provide the desired thermal performance benefits at a reasonable cost. While climate change is often referred to as an abstract far-off phenomenon, the fact is we are already experiencing the effects of a changing climate. Australian average temperatures have increased by 0.9oC since 1950, while the frequency of hot days and nights has increased and the frequency of cold days and nights has declined. Regardless of what climate zone you live in, the same basic Passive Design principals apply. Through careful selection of windows and doors you can gain maximum control over your home’s thermal performance and reduce reliance on artificial cooling and heating. Australians are now using more energy to cool than heat; artificial cooling systems generally consume more energy than heating systems and are expensive to install and operate. In a mixed climate the goal is to stop hear from entering the home during summer and from escaping during winter. In these climates, windows which offer a good compromise between U Value and Solar Heat Gain are required. Alternatively, use of various glasses on certain elevations can help achieve the right balance. Southern Western Australia, parts of New South Wales and South Australia, and Northern Victoria generally fall within this category. Selecting a window or door that combines high performance glass with a quality frame and long-lasting weather resistant seals will result in a high performance, long lasting window and door. Accounting for up to 90% of the thermal performance of windows and doors, glass is the most influential factor in determining window and door energy efficiency. Not all glass products are created equal and its vital to select the appropriate glass for your specific purpose. Decorative glass, whereby an image is encapsulated between two sheets of glass, means you are even choose to incorporate patterns or photos into your home’s design if you so desire. Glass is more than a building material; it offers endless aesthetic and practical benefits. Hopefully it will be part of your home for a long time so it is important top select glass that will meet your design and thermal performance requirements. Involve the application of a metallic film to one side of the glass in order to significantly increase the amount of reflected visible and intra red heat. Double glazed units (also knows as Insulated Glass Units or IGUs) compromise two or more panes of glass, separated by an air (or gas) filled cavity that is completely sealed. IGUs provide thermal insulation and improved acoustic performance while also significantly improving a building’s energy efficiency. A combination of IGUs and performance glazing can prevent up to 50% of heat loss in winder and 87% of heat gain in summer compared to standard 3mm single glazed windows. A range of coatings can be applied to glass to further enhance its properties. 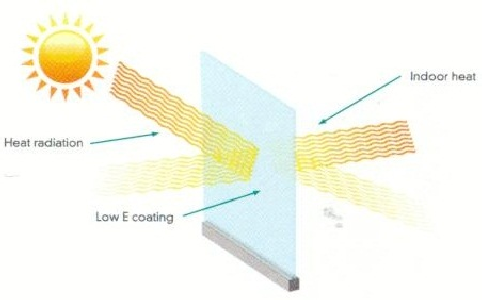 (Low E Coatings )Also known as spectrally selective coatings) lower the amount of heat through windows and doors, by reflecting radiation rather than absorbing it. A low E coating can reflect unwanted heat in summer while retaining heat and preventing it from radiating out in winter. Tinted glass reduces outside glare. Minimising fading to furnishings by UV rays and decreasing solar heat gain. Green, grey, bronze and blue are the most common tints, as they do not significantly alter the colour of the views through the windows. 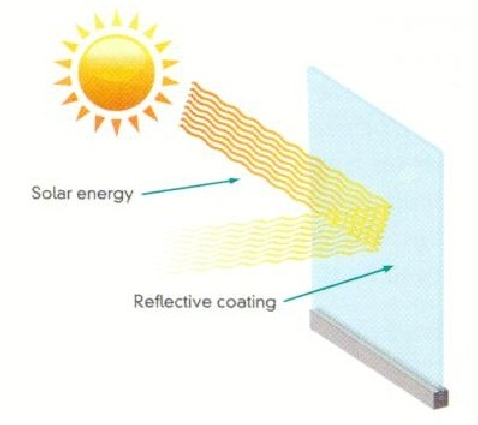 A thin coating that is applied to the glass surface to enable it to reflect short wave (direct solar) heat or long wave (re-radiated/reflected) heat. Glass that reduces heat gain derived from direct solar radiation. This may be achieved via interlayers, body tints, reflective coating or Low E coatings. IGUs provide thermal insulation and improved acoustic performance. 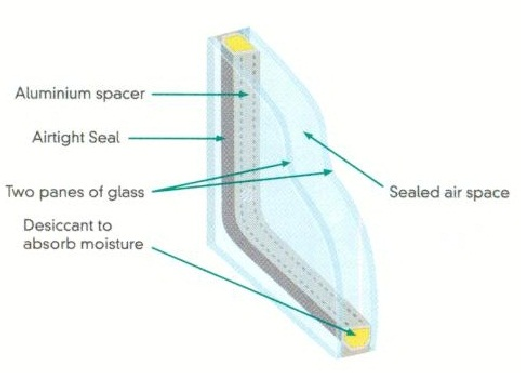 Consisting of two panes of glass separated by an air or gas filled cavity, an IGU is described in terms of the thickness of the outer pain in millimetres, followed by the cavity width and finally the thickness of the internal pane; e.g. 4/12/4. Generally, a 12mm to 15mm cavity width provides optimum performance. The direction a home faces can affect how much energy is used heat and cool. Ideally a home should be orientated north-south to prevent the sun’s rays from penetrating in summer, while still allowing SHGC is a measure of the amount of solar radiation transmitted through a window and released into the home as heat. The lower a window’s SHGC, the less solar heat is transmits; a low SHGC is vital for warm or hot climates. Heat loss and heat gain can occur through leaks in the window or door assembly. Good seals and quality workmanship minimise this. Passive cooling encourages cooling breezes and air movement in summer as an inexpensive way of cooling your home. Passive cooling is best achieved through orientation to cooling breezes, increased natural ventilation, a light coloured roof and wall finishes, and appropriate windows and glazing to minimise heat gain. Usually green, grey, bronze or blue, toned or tinted glass can shade internal areas and reduce the amount of heat entering through the window. This will keep the building cooler and reduce glare and UV rays. Panes are assembled from two sheets of glass with an adhesive interlayer. Laminated glass when broken will not shatter or splinter leading to greater safety and security. Laminated glass eliminates nearly 99% of harmful UV rays, reducing fading to floors and furniture. A specialised interlayer in laminated glass can further reduce Solar Heat Gain Coefficient. Passive solar heating aims to keep the summer sun out while still allowing the winter sun in. As well as using orientation and shading, passive solar heating is best achieved through effective insulation, draught sealing and high performance glazing. Window frames and the type of glazing used play a big part in passive solar heating. U Value measure the rate of heat flow through a window due to temperature difference between the indoor and outdoor environment, taking into account the effect of the frame, glass, seal and any spacers. Heat is lost and gained through a window by the combined effects or conduction convection and radiation. The lower the U Value, the higher the energy efficiency of any window or door. A metallic coating is applied to one side of the glass in order to significantly increase the amount of reflective visible and infra red heat. Shading a home can improve comfort and increase energy efficiency. It is important to install effective shading devices to block summer sun from the north while still allowing the lower angled winder sun in. VT is a numeric measure of how much visible light is transferred through the window. The higher the VT, the more daylight that is openly transmitted. related to artificial heating and cooling. building materials to store heat. Thermal mass is used to store heat. more moderate all year round. heat from entering the building. little as 1% to the total building cost..
OrientationOptimal positioning of a home on its site can have a significant impact on its thermal performance. During winder the most sunlight enters a home through north facing windows and doors.If your site doesn’t permit or alternatively you are renovating an existing orientation, energy efficient windows and doors will prevent heat gain and heat loss and help ensure your home is thermally efficient. Areas that are used for relatively short periods of time such as bathrooms, laundries and garages are best positioned on the west to provide a buffer against the extreme summer heat. To ensure you enjoy the maximum benefits of solar heat, position rooms that generally require heating, such as living areas, on the north side of the house. Whether it be the roof, walls, doors or windows, it is imperative that premium insulation is achieved and that all gaps are filled to keep wanted air in and unwanted air out. High performance windows and doors provide superior insulation when combined with other insulation materials. This reduces the amount of artificial heating and cooling needed to maintain thermal comfort, which in turn means smaller heating and cooling units and decreased running costs. Whether it be the roof, walls, doors or windows, it is imperative that premium insulation is achieved and that all gaps are filled to keep wanted air in and unwanted air out. High performance windows and doors provide superior insulation when combined with other insulation materials. This reduces the amount of artificial heating and cooling needed to maintain thermal comfort, which in turn means smaller heating and cooling units and decreased running costs. The following checklist provides a sound starting point for considering how best to maximise the energy efficiency of your home by utilising passive design principals. The main living areas are oriented north to maximize winter sun and minimize summer sun.  Rooms are zoned or grouped and divided as needed for economical heating and cooling.  Eaves or other shading devices have been incorporated to provide shading from summer sun and allow winter sun to enter.  Windows and doors are located to get good natural cross ventilation and to ventilate bathrooms and wet areas. Energy saving is becoming more and more a part of our daily lives, with this in mind Aview Windows & Doors is proud to offer a range of Energy Saving types of glass; known as Sunergy and Solar Control. Energy Saving glass is known as Low Emissivity glass; commonly known as Low E. Low E glass has a thin metal oxide coating fused to the glass while it is still hot during the manufacture process. This coating is a Pyrolytic hard coat, with the advantages of durability and being able to be toughened. Low E glass enhance insulation and provides additional solar control, with high light transmission and low reflectivity providing excellent performance in the control of both solar heat gain and thermal insulation. This makes it ideal for warm and cool climate applications. Our range of Sunergy and Solar Control glass can be used in many ways, whether it be single glazed applications, or as part of a custom laminate make up. Or even as part of an Double Glazed Unit. With the amount of versatility energy saving glass can be used for nearly every kind of application.